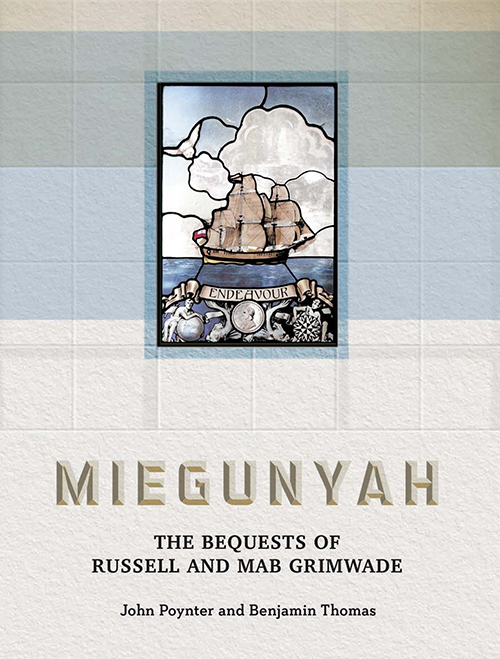 The Australian Institute of Art History proudly announces the publication of Miegunyah: The Bequests of Russell and Mab Grimwade, 2015, a research project on the philanthropy of the Grimwade family. The volume contains essays by the Chancellor of the University of Melbourne, Elizabeth Alexander AM, Sir Andrew Grimwade CBE, Professor Emeritus John Poynter, Dr Benjamin Thomas Rusden Curator of Trinity College, and Professor Jaynie Anderson, Director of AIAH. The great bequests of Russell and Mab Grimwade have opened up extraordinary opportunities for the University of Melbourne, enabling an exciting range of initiatives. Through the Miegunyah Distinguished Visiting Fellows program, Australia has benefited from the visits of more than a hundred international academics. The University's cultural collections have been enriched by the treasures of the Grimwades' collections of art, rare books and Australiana. Russell Grimwade's passion for chemistry, appreciation of art and sense of obligation to preserve the past has driven the development of the Grimwade Centre for Cultural Materials Conservation. Russell's first allegiance may have been to biochemistry, but he had a wider vision: to fund the 'birth of an antipodean Clarendon Press' at Melbourne University Press. The distinguished Miegunyah imprint has realised his ambition and this book is the most recent volume in that series. The Grimwades' bequests still remain one of the University of Melbourne's most significant gifts. This is the story of Russell and Mab Grimwade and their legacy to the Australian nation. Available in all good bookstores and from the Melbourne University Publishing website.